Disney has revealed more information about the upcoming Toy Story Land that is being planned for Disney’s Hollywood Studios at Walt Disney World, including details on its two new attractions. When it opens, Toy Story Land will allow guests to explore Andy’s backyard with their favorite Toy Story characters. 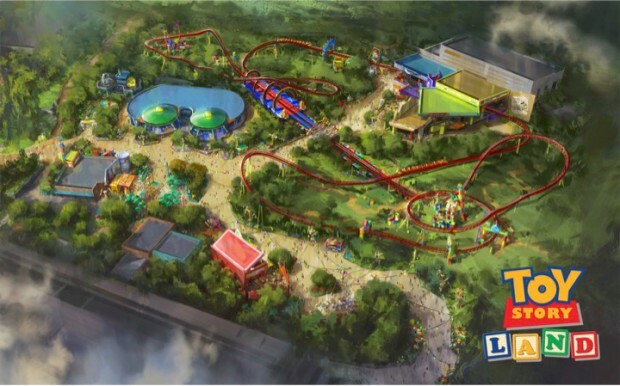 One of the attractions being developed for Toy Story Land is Slinky Dog Dash, a family coaster that Andy has built in his backyard using his Mega Coaster Play Kit…along with some of his other toys. The other attraction is Alien Swirling Saucers, where guests will join the little green aliens from Pizza Planet as they fly around in their toy flying saucers while “the claw” looms overhead. Disney also announced that beginning this Memorial Day weekend, capacity for Toy Story Mania will increase as a third track is opened.